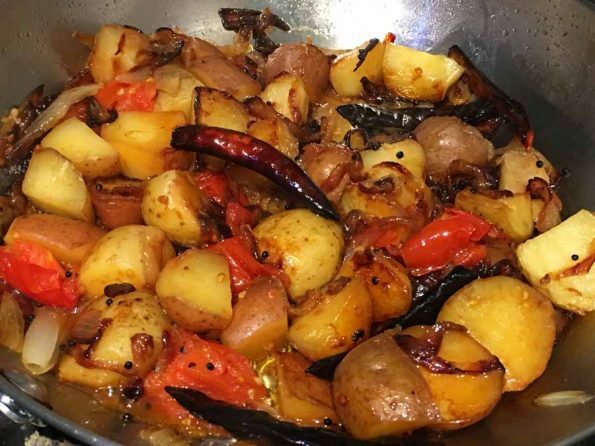 This pan fried baby potatoes recipe uses a mix of red baby potatoes and yellow baby potatoes(creamer potatoes variety), you can try this for other kind of baby potatoes of either one color as well. 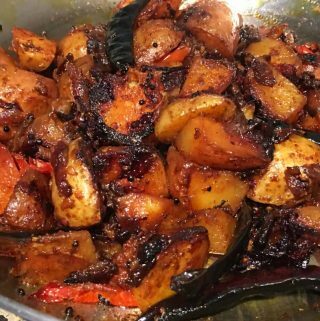 This pan fried baby potatoes is very delicious and you can serve this vegan/vegetarian dish for lunch or dinner. 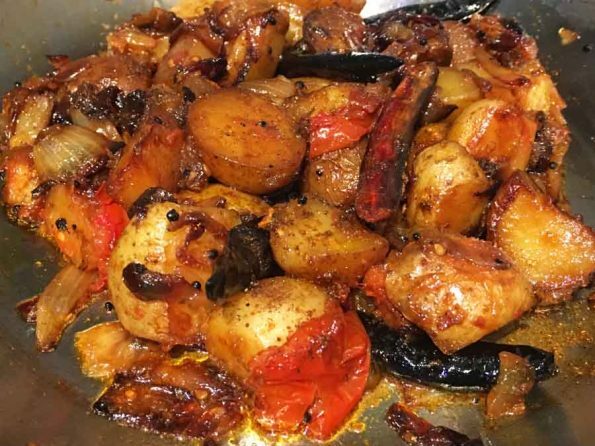 We do not deep fry the baby potatoes rather we stir fry the potatoes along with lightly fried onions and tomatoes along with spices, which makes it so so yummy! 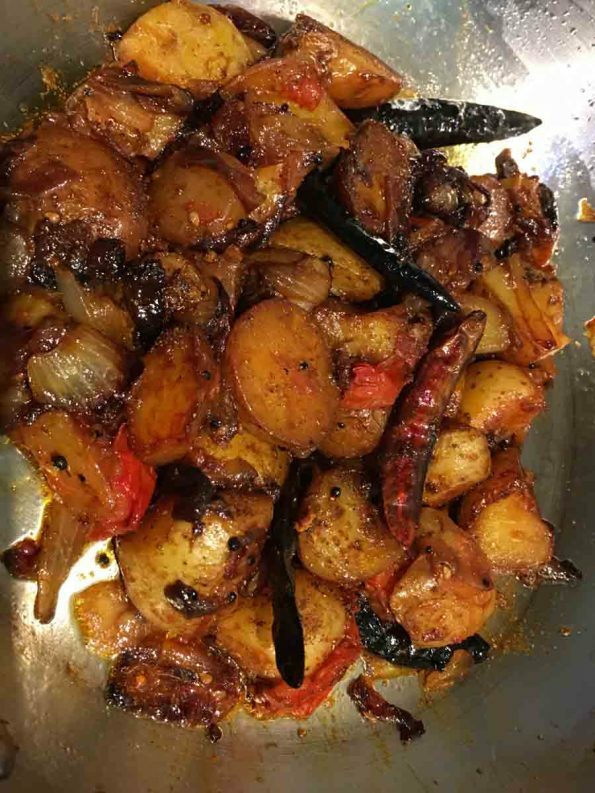 This pan fried baby potatoes recipe is inspired by South Indian style cooking as we use the South Indian spices to make the dish. Feel free to adjust the spices according to your preference! 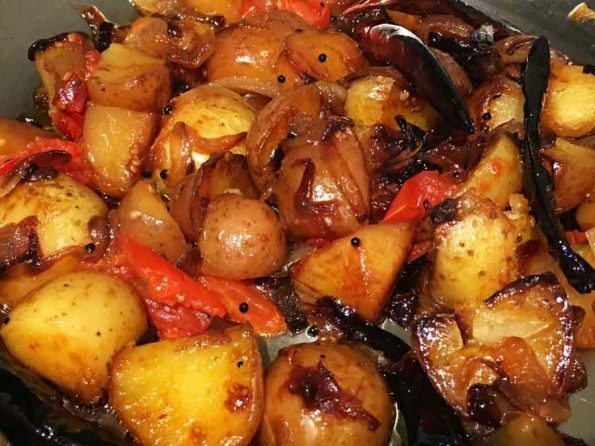 You can find more South Indian potato recipes for lunch and dinner here. As I mentioned above, I used creamer potatoes to make this dish. 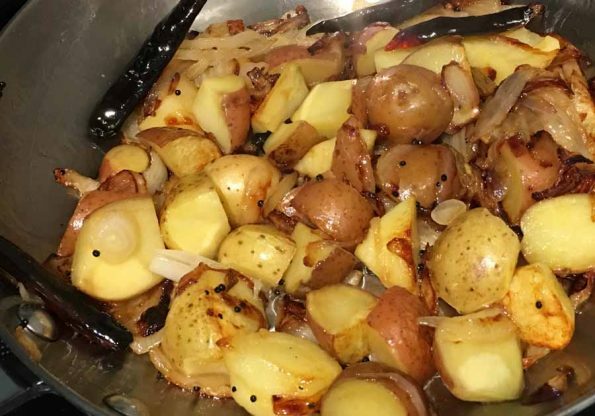 Creamer potatoes are very yummy when used in recipes. 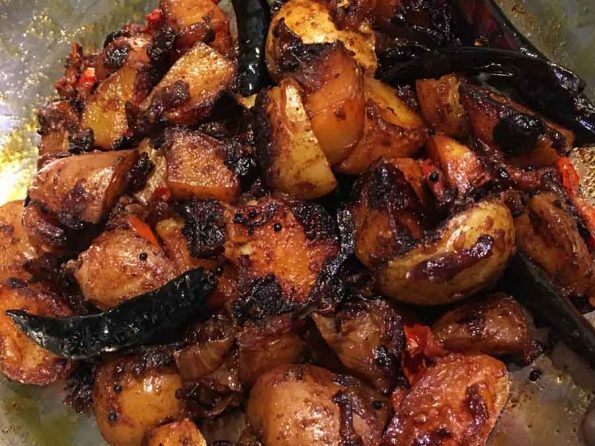 I used the skin of the potatoes for the recipe as the skin is healthy and yummy. However you can peel the skin of the potatoes if you wish, or just include them in the recipe as I have used here. I have a few tips if you are using the skin of the potatoes though. If you are using fresh potatoes, the skin of the potatoes usually is fine and taste good. If you are using the peels, make sure the skin is not turning green or if its turning green, peel off that part of the skin. Also peel off any growth on the potatoes. Transfer the potatoes to a large bowl with water and mix in some salt. Let the potatoes sit in the salt water for about half an hour. After letting the potatoes soak in the salt water for half an hour, rinse off the potatoes in fresh water. All the above tips will help you with getting rid of the bitterness which can be caused by using the skin of the ‘not so fresh’ potatoes in the recipe. 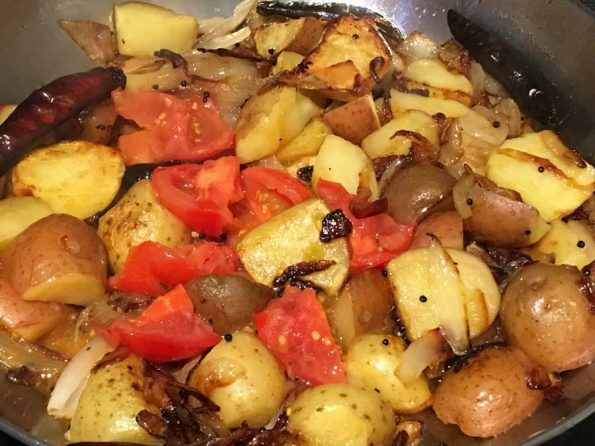 Whether you decide to keep the skin of the potatoes or to peel off the skin, the pan fried red baby potatoes are delicious with onion, tomatoes & spices. 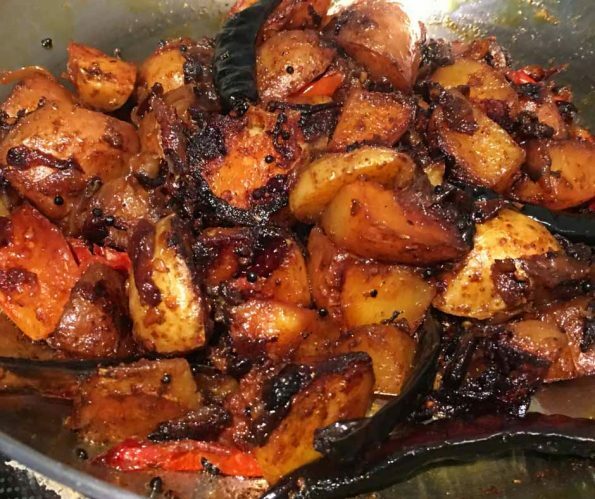 So here is how you can make this yummy pan fried red baby potatoes following this pan roasted or pan fried baby potatoes recipe. Indian style spiced pan fried baby potatoes make a simple and yummy side dish with rice for lunch or dinner. Peel the onions & slice thinly, keep aside. When the mustard seeds splutter, add the red chilies fry for a few seconds. Add the sliced onions to the pan, add little salt and saute the onions until they are lightly browned. 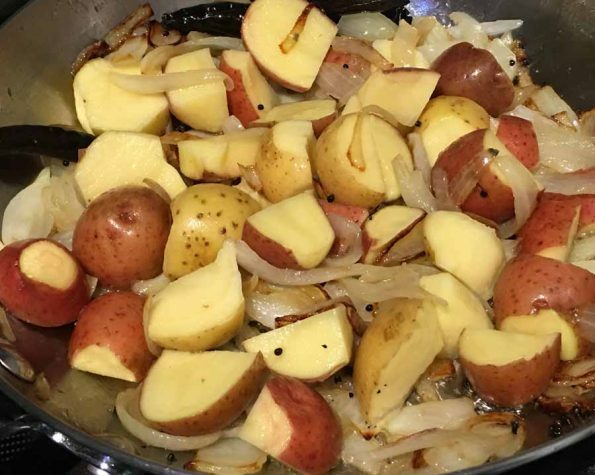 While the onions are getting sauteed, slice the potatoes and keep aside. Once the onions are browned, add the diced baby potatoes and saute for 3 to 4 minutes. Add enough salt, crushed ginger & garlic and saute for another 2 to 3 minutes. Continue to saute the potatoes until they start to brown on sides. Meanwhile chop the tomatoes, keep aside separately. Once the potatoes are lightly browned on the sides, add the chopped tomatoes to the pan and saute for another 2 to 3 minutes. Close the pan with lid and cook in medium heat for about 7 to 8 minutes or until the potatoes are cooked and soft on inside. Once the potatoes are cooked enough, remove the lid of the pan and stir all the contents. Add the spices - turmeric powder, red chili powder and garam masala powder to the pan and mix everything well. Saute the contents in medium heat for another 3 to 4 minutes or until the mixture is dry and the potatoes are pan fried nicely with the onions, tomatoes & spices. 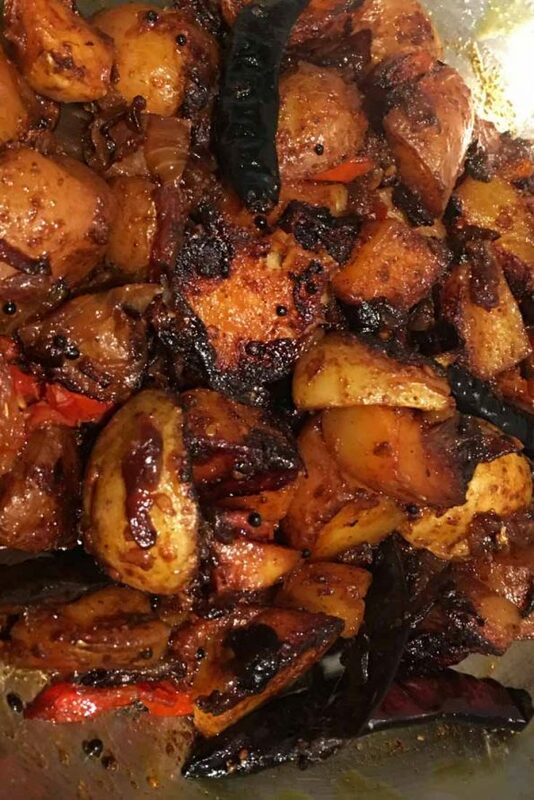 Serve the pan fried potatoes for lunch or dinner along with rice or bread as you wish! Hope you found this post on pan fried baby potatoes recipe helpful!